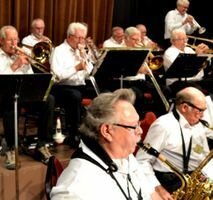 On Thursday, October 11th, Hidden Valley presents a Dinner/Dance featuring live Big Band music with swing dancing at Hidden Valley Theatre, 104 West Carmel Valley Road, Carmel Valley, California 93924. The Dinner/Dance highlights 1940's style Big Band tunes performed by the Road Scholar Big Band under veteran conductor Craig Buhler. Buhler, who also plays tenor sax in and directs the Seqim Stardust Big Band, launched his music career in the 70's as a charter member of Honk which toured nationally with the Beach Boys, Loggins & Messina, and Chicago. Dinner is served buffet-style at 6:30 pm in the Hidden Valley Theatre; dancing starts at 7:30 pm.